Kal guksu literally means "knife noodles" in Korean and the name comes from the fact that its noodles are cut rather than extruded or spun. It consists of handmade, knife-cut wheat flour noodles served in a large bowl with broth and other ingredients. The noodles are made with dough from wheat flour and eggs, sometimes containing ground bean powder for additional texture. The dough is usually left to "breathe" then rolled out thinly to be cut into long strips. The broth is usually made with dried anchovies, shellfish, and kelp but chicken broth can be used as a substitute. Very similar to sujebi, ingredients are simmered together for many hours in order to obtain its rich flavor. 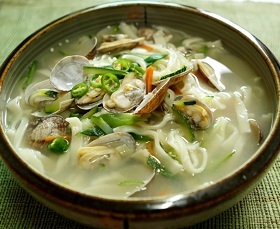 It consists of similar vegetable and seafood contents such as zucchini, potatoes, scallions, clams and shrimps. Usually seasoned with salt, the noodles are served with garnish of choice and it is traditionally considered a seasonal food, consumed most often during summer.